When my husband and I got married we always knew we wanted to have a big family. We had our first daughter who was healthy and simply a very easy baby. Shortly after her first birthday, we decided we wanted to have another child and after trying unsuccessfully for a while we found out I had PCOS. After discussing some options with my doctor, we decided to try Clomid. The first two rounds were not successful so we decided to try one more time. It was the third time of trying when we found out we were pregnant. During this pregnancy, I had preeclampsia and borderline gestational diabetes. J.R. was ready to make his appearance with a fast birth and awesome Apgar scores, and he took to breastfeeding right away. As a baby, J.R. was the opposite compared to his older sister. He wanted to eat all the time and was a very fussy baby. My husband and I assumed he was a colic baby. At around 6 months old his skin color was off. He had a yellow tint to him but being 1/4 Korean we thought maybe that was the cause. Our pediatrician drew blood testing various things he thought could be the cause even suggesting maybe we were feeding J.R. too many orange foods like carrots, squash, and sweet potatoes. paramedics asked me questions that I answered the best I could and during this time he was still seizing. Once arriving in the ER they rushed us back into a room and gave him a bolus of dextrose causing his sugars to shoot into the 300’s. He stopped seizing after about 15 minutes and still seemed dazed. During this, the nurse asked me if I knew his blood sugar was 59 at his 9 months check up which I had not known and his doctor never told me. After getting him stable he was moved into a room on the peds floor. 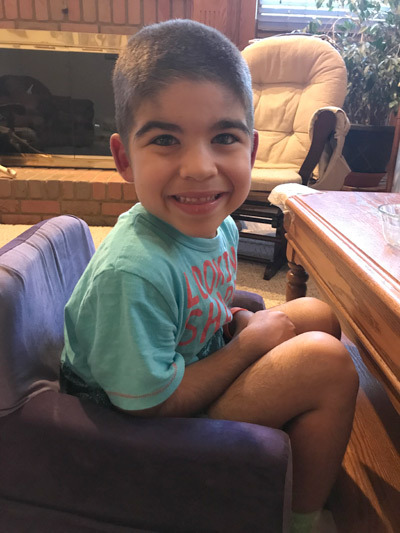 After debating what to do and some unsuccessful blood draws we talked with another pediatrician in our doctor’s office and decided to have him transported to Ann and Robert Lurie Children’s Hospital in Chicago. Once admitted to children’s hospital the endocrinology team came up with a plan and decided to have J.R. fast to figure out if he had hyperinsulinemia. During this time I had canceled his huge first birthday party that was planned in Ohio with family and friends and was less than a week away. While he was in the hospital we celebrated his first birthday the best that we could, and after many tests, blood draws, fasting, and trying meds he was released after ten days. He was diagnosed with hyperinsulinism and put on Diazoxide and Diuril. We learned how to check his blood sugar and how often we should check it. We met with the head endocrinologist every three months. We were finally learning how to handle our new life with a “sickly” child. J.R. was developmentally delayed and needed speech therapy, physical therapy, and occupational therapy. His yellow skin color went away once he started his medicine and he began to grow very hairy as a side effect of the Diazoxide. In 2012, we welcomed our third child, Sara, a healthy girl with no blood sugar issues, and in 2014, we welcomed our other son, Evan, who also was healthy with no blood sugar issues. J.R. is our only child with this condition. We moved to Ohio to be closer to family and our son is under the care of a team of doctors at University Hospitals Rainbow Babies and Children’s Hospital. J.R. is in Kindergarten now and no longer receives any therapies. He is still closely monitored and taking the two medicines, but he is having fun like a kid his age should. We as a family have a schedule that we follow with him and we make sure that his siblings and others understand why we do certain things for him.